Lamjung Himal Trek offers an impressive view of north central Himalaya of Nepal. The journey traverses 4000m above the Marshyangdi George and quite near Lamjung Himal. Between Kathmandu and Pokhara there are three major groups of peaks; Ganesh Himal, Manaslu, Himal Chuli. Lamjung Himal Base Camp Trek is suggested my many trekkers which is at a convenient distance from capital city Kathmandu. This is trek is famous for village life, Tamang and Gurung culture, lush green forests, terraced farm lands and soaring Lamjung Himal with giant Annapurna Mountains. 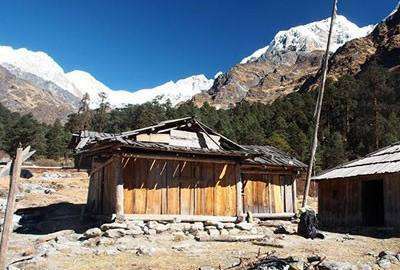 Manaslu west face and Peak 29 (Ngadi Chuli) adds more attraction on this trek. This beautiful trek commences from Besi Sahar through the beautiful villages of Ghale Gaun, Bhujung, Ghanpokhara, and towards Sikless Village is possible but knowledge of local guide is important. The area offers home stay facilities in the villages. Local dance and singing is programmed per the visitor’s interest while trekking in Lamjung Himal Base Camp which offers insight experience of rural life in mid western life of Nepal. ACAP permit and TIMS card as the trekking permit are required for this trek. All airport pick up and transfer to hotel. 2 Nights deluxe room 3 star category hotel on twin/double sharing with breakfast. 1Night sharing twin/double bed room in tourist standard hotel in Pokhara with breakfast basis. Experienced, friendly and licensed local trekking guide. Necessary porters to carry camping gear, meals and clients baggages. Kathmandu Beshishar overland transportation by tourist bus. Full board meal (veg. / non veg.) prepared by our expert cook who will prepare food entire the trek. Kalikasthan to Pokhara overland transportation by private. Pokhara - Kathmandu overland transportation by tourist bus. Transportation, Meals, Accommodation and Wages of your trekking support team. All local tax, vat and service charges. Personal insurance, laundry service, phone calls and internet.